It had grown so late on Tuesday night that it had become Wednesday morning. Two bars had called time on us, a third had already closed its shutters by the time we reached it. Apparently there was only one option left to us, just around the corner. It was dark, furnished in wood, soundtracked by disco and full of smoke. It was perfect. While we danced to some of the greatest foot-movers the 70s had to offer, Mijalkov’s former boss, Prime Minister Nikola Gruevski, was walking out of EU-brokered negotiations with opposition leader Zoran Zaev in Strasbourg. To no one’s great surprise the 10 hour talks were largely fruitless. 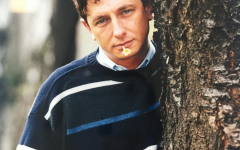 Zaev wants Gruevski to go, Gruevski doesn’t. 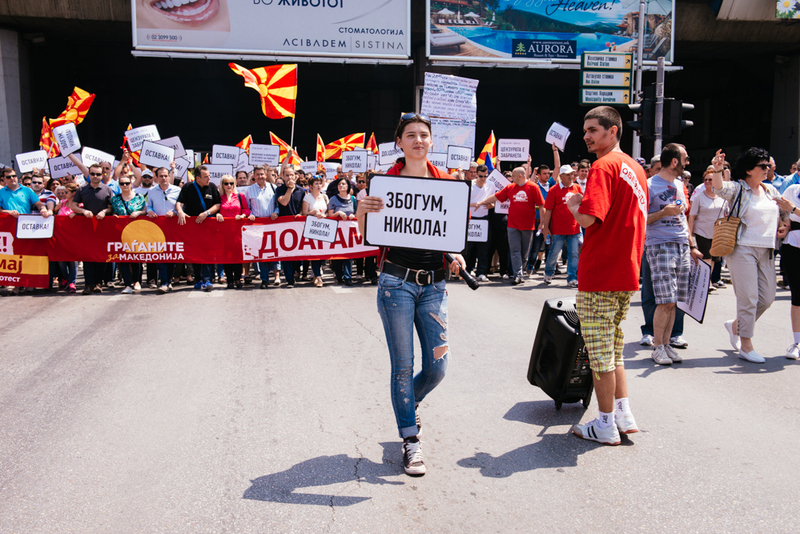 While the politicians were talking and we were dancing, two protest camps were holding vigil in Skopje. 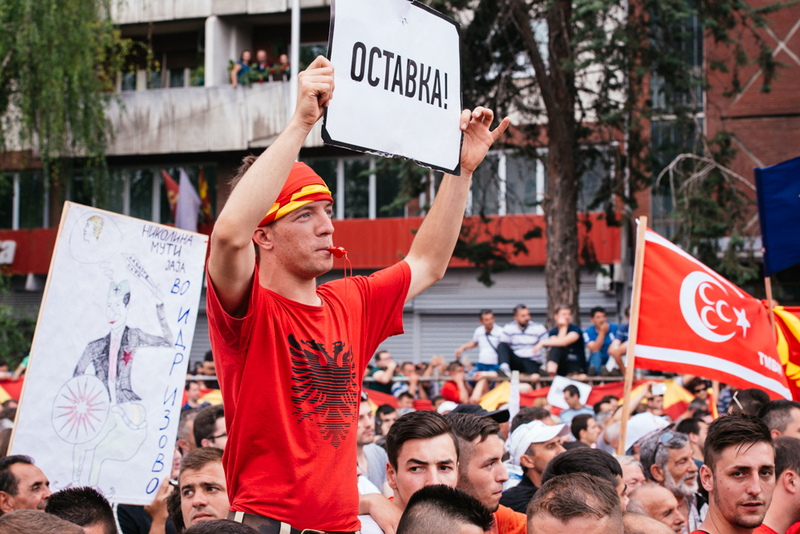 One, joining Zaev’s call for the prime minister’s resignation, although not necessarily pro-Zaev, erected its tents outside the government following a tens of thousands-strong protest on the same spot on Sunday. 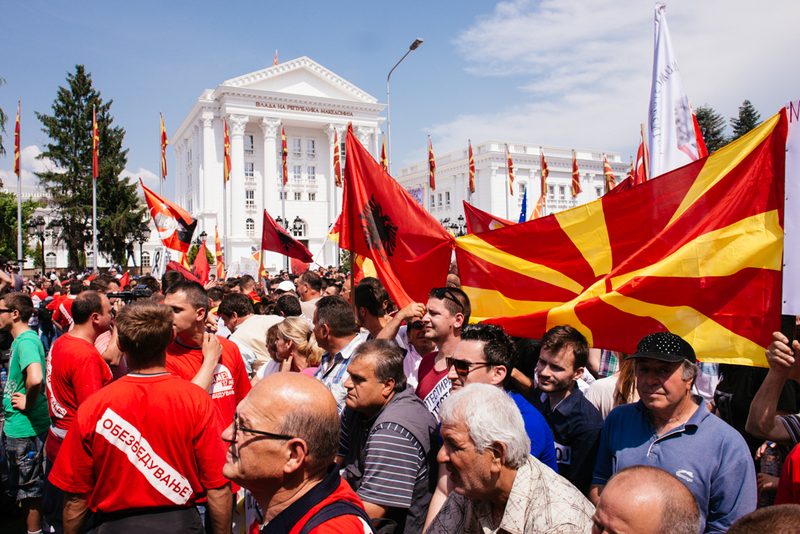 The other is holding court in front of the parliament, pledging allegiance to PM Gruevski’s VMRO-DPMNE. 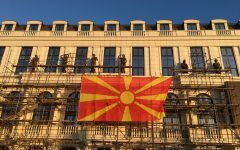 Their tents went up on Monday evening while the scaffolding was being dismantled following a similarly well attended VMRO party rally. Both Sunday’s protest and Monday’s rally were pieces of theatre. Both featured flags and cheering crowds packed down streets in front of music festival-style stages and bellowing sound systems. On Sunday, the speakers warmed up the crowd by pumping out cheerful patriotic rock and remixes of wiretapped government phone calls. Video messages of solidarity from overseas were played on stage. 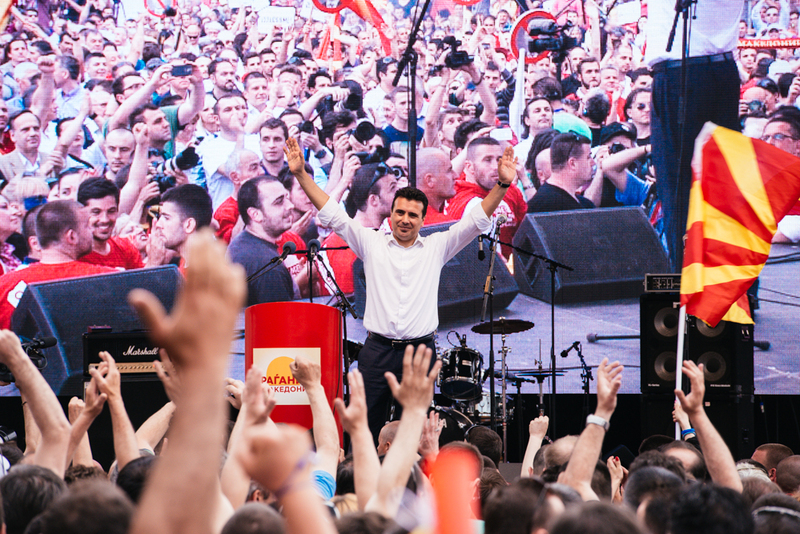 After some time, Zaev made his way from the back of the crowd to the stage. The response was reminiscent of a US presidential hustings. Supporters flocked to the opposition leader, embracing him for selfies. 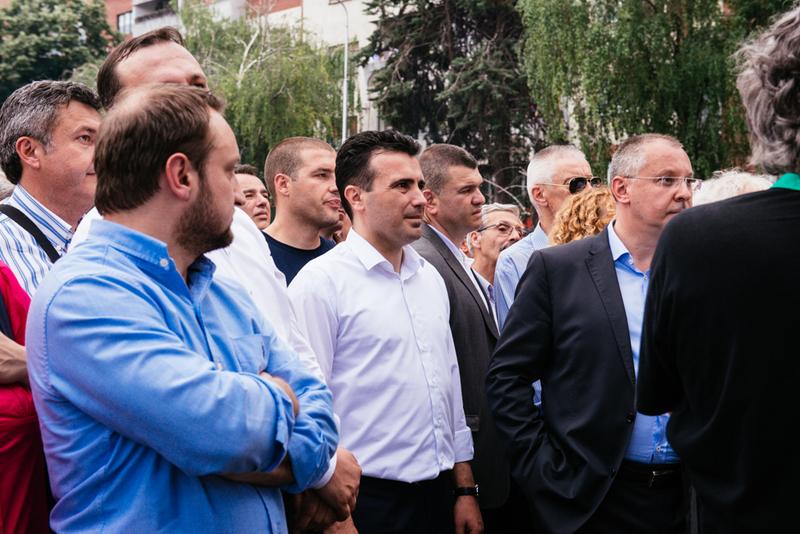 Zaev was all smiles and waves, apparently at ease despite the serious criminal charges he is currently facing for his part in the publication of the alleged government wiretapping program. Conviction in the necessity of bringing the government’s nine-year reign to an end united Sunday’s crowd. 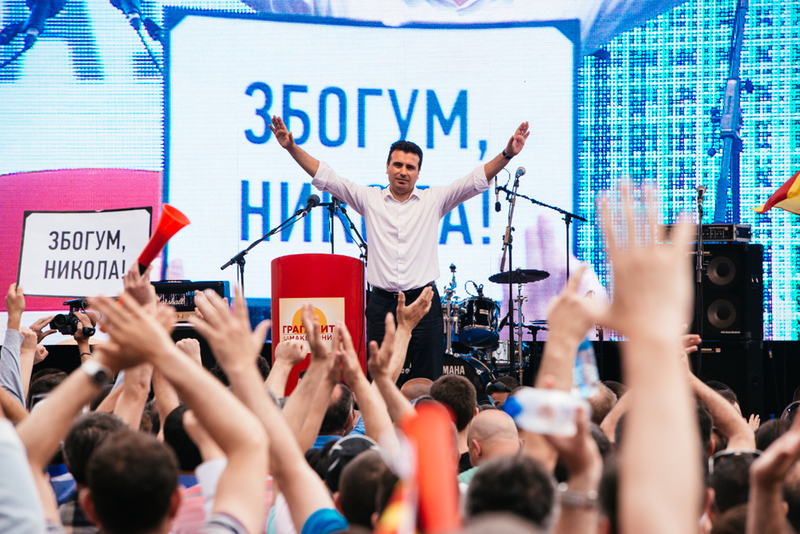 Echoing a popular sentiment that day, law student Aleksander Chokrevski said, “If we need a guy to get the job done, that’s Zaev.” He cited Zaev’s track record as mayor of Strumica, a municipality in the south east of Macedonia reportedly thriving under his leadership. But not everyone was so sure of Zaev’s suitability as a replacement. Simona Ivanovska, also a student, was wary of swapping one established political figure for another. 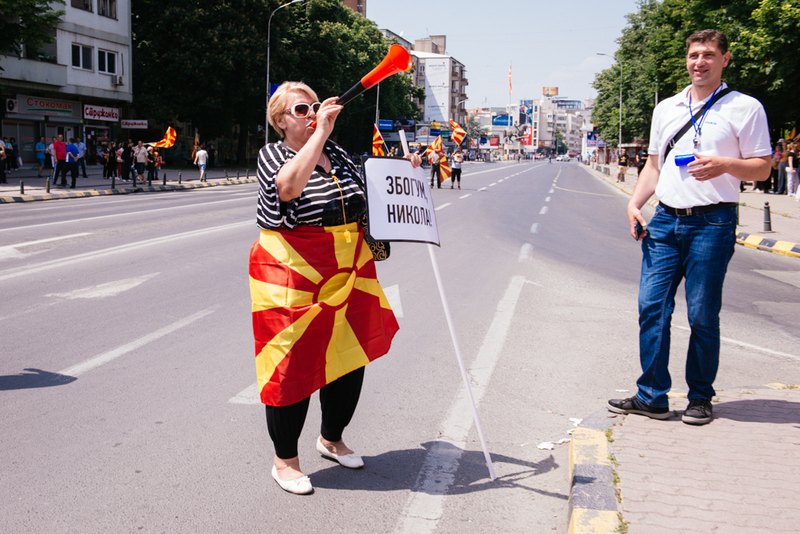 “I’m not sure,” she said of Zaev. “We’re talking about the two biggest political parties here. But I am grateful for what he’s done.” Whatever the outcome though, she believes the status quo has to shift. “Politics is always politics, but the last 10 years was too much,” she said. 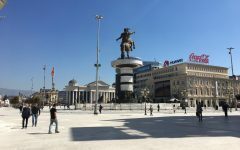 On Tuesday evening approximately 50 anti-government activists gathered on a graffiti-strewn open air theatre in Skopje’s City Park. 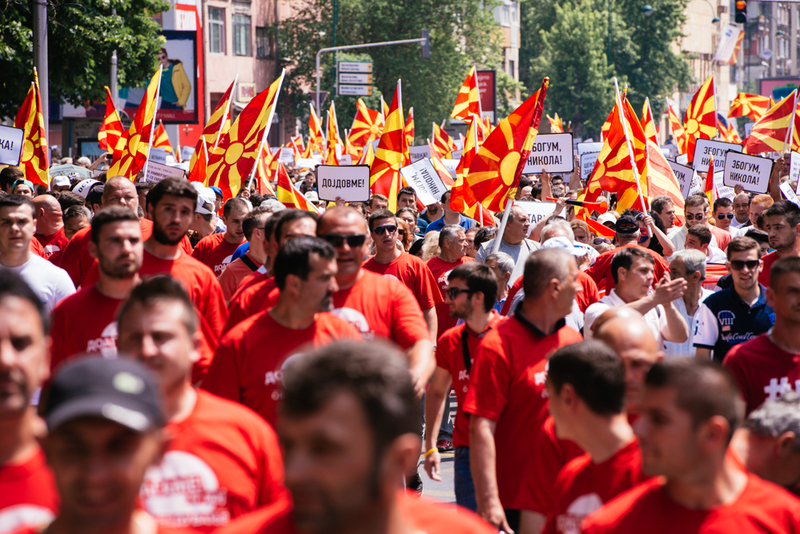 They met to discuss whether to continue to align themselves with the protests organised by Zaev — about whom many of them harbour misgivings — or to begin demonstrations separate from any major political party. 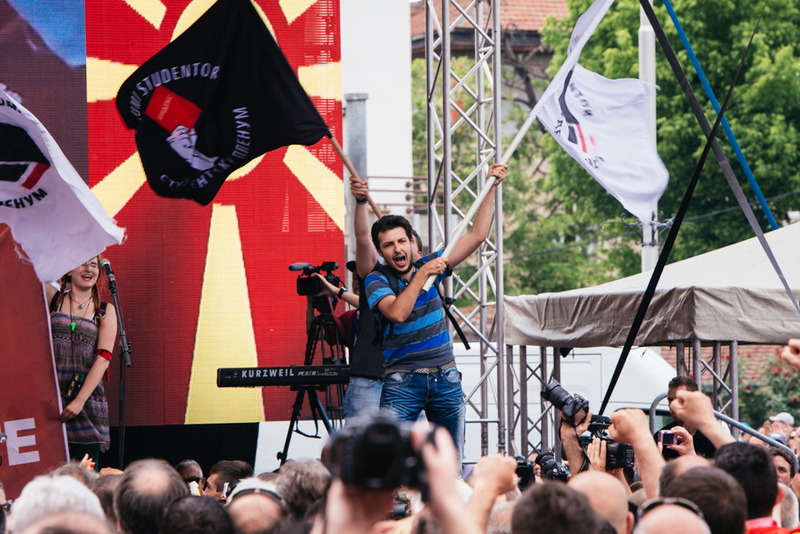 The anti-government movement appears split between those who are happy for Zaev to be its de facto figurehead and those who find his level of involvement problematic. 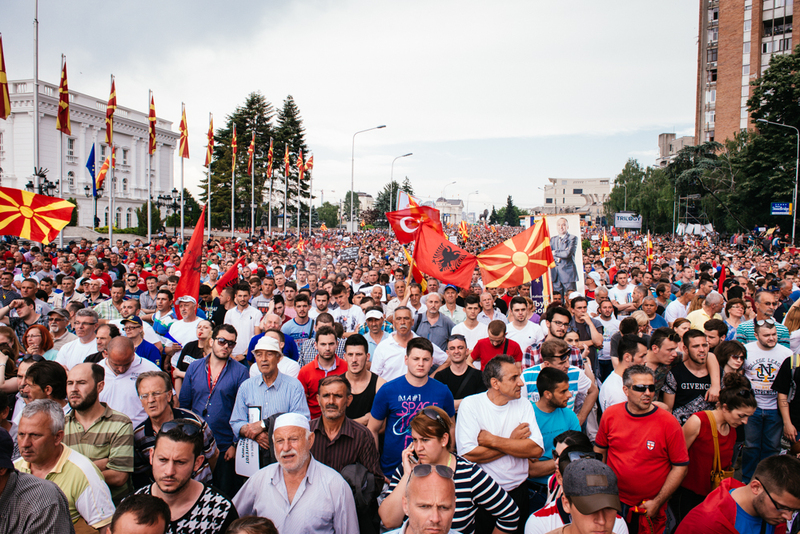 Monday night’s VMRO rally showed that a split cuts through Macedonia also. Whereas Sunday’s protest felt like a jubilant street party, the banging war drum seemed to be in the air on Monday. Bright white lights coloured the crowd in a shadowy contrast. The music was dark and ferocious, male voice choirs booming in unison over crashing cymbals and thundering bass. Fences had been erected on either side of the street to concentrate the crowd. The enclosure was dubbed “Nikola’s Cage” by anti-government humorists. Contrary to what I had been led to expect, the mood inside the “cage” was impassioned and celebratory. I had been told to expect legions of apathetic state employees, summoned to the rally on pain of losing their jobs. 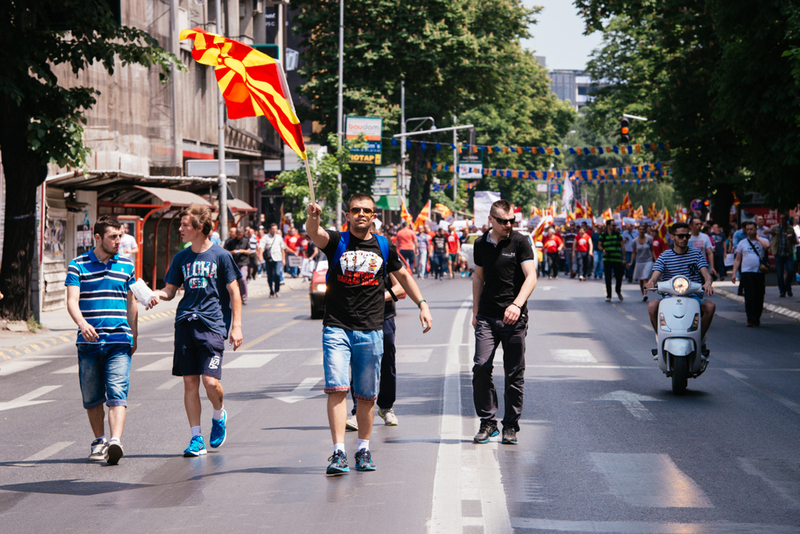 What I found were thousands of ardent flag wavers, lustily booing at the mention of Zoran Zaev or his party, SDSM. 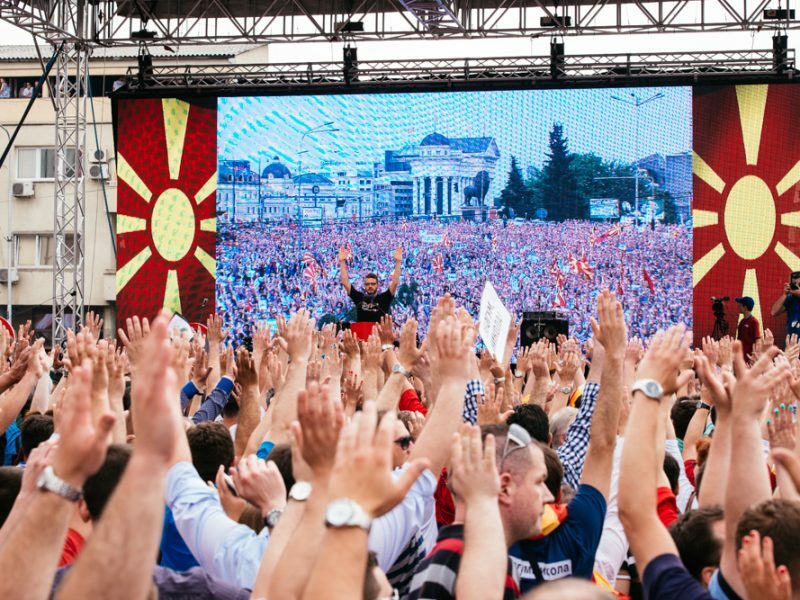 The consensus among the crowd was that Nikola Gruevski is the man for the job when it comes to securing Macedonia’s economic prosperity and national security. 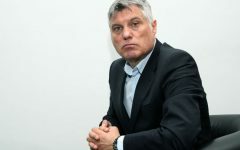 As for Zaev’s tapes, “These are private conversations, all governments say bad things,” one of the party faithful explained. Estimates of the size of the crowds on Sunday and Monday varied greatly. Supporters of either side will happily pull up aerial photos of each rally superimposed with pseudoscientific coloured rectangles purporting to calculate greater attendance at their own camp. 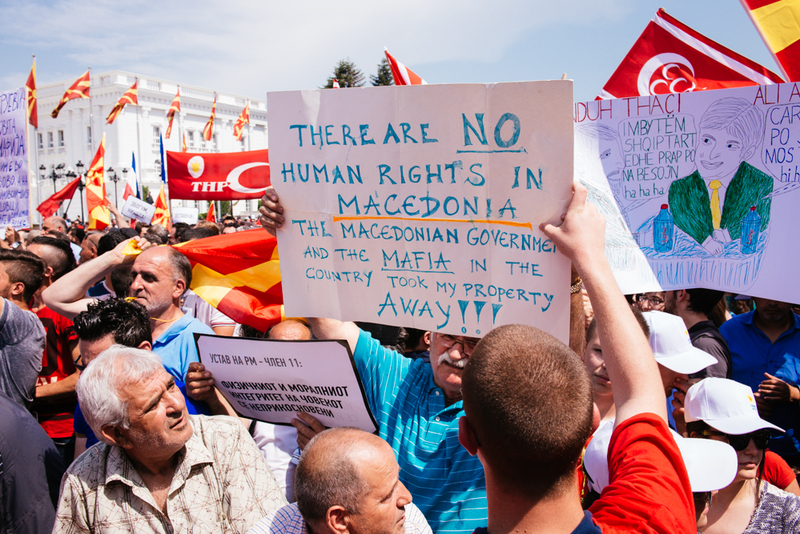 As with much in Macedonia these days, we will probably never know the full truth. What is important is that both numbered in the tens of thousands, showing a wide support base for the pro- and anti government positions. The crisis is not a clear cut case of a universally despised authoritarian clinging on to power. 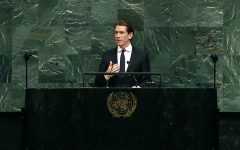 If the scandals documented on Zaev’s tapes prove true, there is no way Gruevski and his government can continue to claim legitimacy in the international arena. 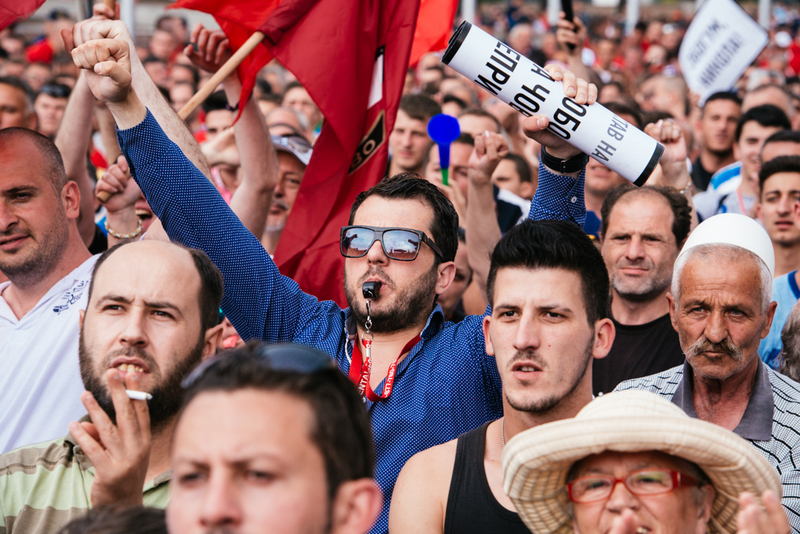 All photos of the anti-government rally on May 17, 2015 by Jacopo Landi for Balkanist. 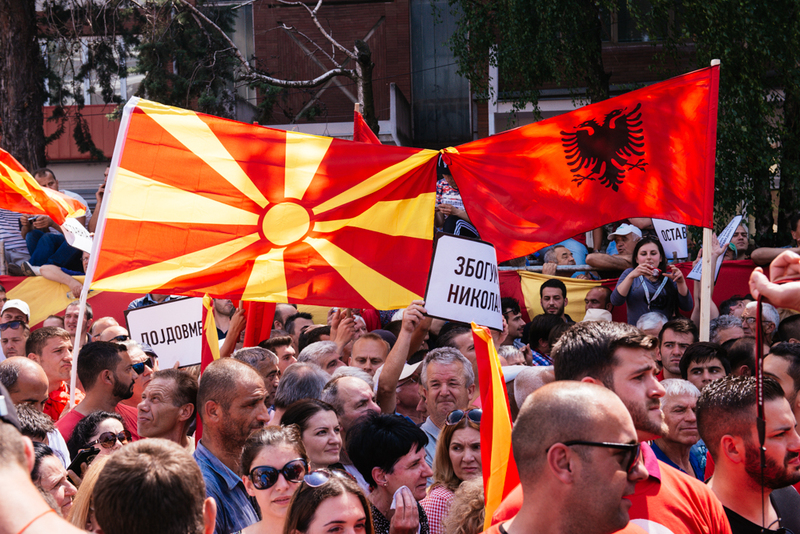 We Asked: What’s Next for Macedonia?